Sinful Southern Sweets: Double Cookie Layer Dessert AND Tate's Cookie Giveaway!! Double Cookie Layer Dessert AND Tate's Cookie Giveaway!! *Please read to the end of the post for the Tate's Cookie recipe. Did you know that October is National Cookie Month? Yes, that's right. So, I thought we should to start this month off with a recipe including cookies. This is not just a cookie recipe, but a layered recipe containing some of the best purchased cookies around: cookies from Tate's Bake Shop. If you've forgotten about Tate's, I did a review about this sweet Bake Shop last year. You can read about it here. To celebrate National Cookie Month, Tate's asked me to try out some of their newest cookies, the Whole Wheat Dark Chocolate Chip cookie –which won GOLD in the Cookie category in the 2011 sofi™ Awards, presented at the Fancy Food Show (known as the Oscars® of the specialty food industry) in Washington, DC. Well, you know me. I'm not one to turn down award winning chocolate chip cookies. So, I fell in love with Tate's all over again. There are so many positive things to say about these great cookies. My favorite thing about them- besides the fact that they are thin and crunchy and buttery and addictive- is that they are natural. You know what makes homemade cookies so wonderful? Well, it has a lot to do with the fact that they are simple and not stuffed with every conceivable preservative on earth. Tate's Whole Wheat Dark Chocolate Chip Cookies, which do not taste whole wheat in the slightest, contain 10 ingredients: chocolate chips, wheat flour, sugar, brown sugar, butter, eggs, baking soda, salt, vanilla and water. I don't know about you, but that's what I make my own chocolate chip cookies with too! 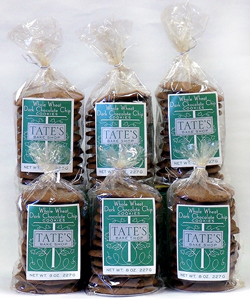 Its very rare to find packaged cookies that taste like homemade, but Tate's has got it perfected with their buttery, crunchy cookies. Ok, so back to the recipe. This is a classic layered dessert. Great combination of crunchy meets creamy. I've had it many times, but never so good. It begins with a nutty shortbread like crust enhanced with a few of Tate's cookies. This layer is baked and cooled and topped with a cream cheese layer. 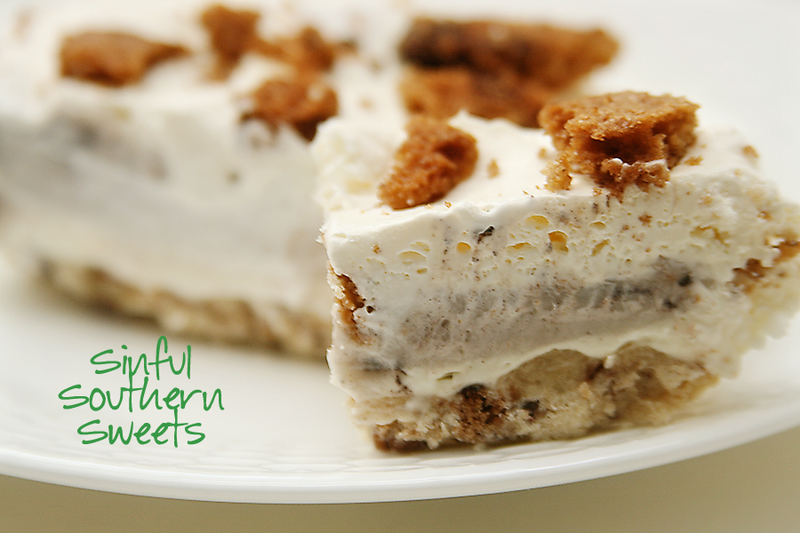 This layer is covered with crumbled Tate's cookies, Oreo Pudding and Cool Whip. The perfect beginning to Cookie Month!! Enjoy! **Please read on after recipe for GIVEAWAY!! featuring Tate's Bake Shop Cookies! Combine the flour, nuts, butter and 3 crumbled Tate's cookies. Press mixture into a 13x9-inch pan. While cooling, combine the cream cheese, powdered sugar and 1 cup Cool Whip. Spread over first layer. Crumble remaining cookies (reserve 1/4 cup) Top cream cheese layer with remaining cookies (except for the 1/4 cup). Set aside. Spread with remaining Cool Whip. Top with 1/4 cup remaining crumbled cookies. Chill. Now, if you've hung around this long, you're probably waiting for the Tate's Giveaway. Tate's Bake Shop is in the celebrating mood too! In honor of National Cookie Month, they are offering Sinful Southern Sweets readers 15% off your purchase the entire month of October when you use the discount code COOKIE at checkout. Also, they will are giving one lucky winner three bags of the Whole Wheat Dark Chocolate Chip cookies and a signed copy of Kathleen King’s cookbook, The Tate’s Bake Shop Cookbook. Yea for National Cookie Month!! 1)Be a Google Follower of Sinful Southern Sweets:You must do this before any other entry can be made. **Please leave a separate comment for each entry you make. Leave your email in your comment, if it is not visible in your profile. We want to be able to get you those cookies if you win!! Giveaway will end on October 15th at midnight. Winner to be announced October 16th and chosen via Random.org. Entries open only to US residents. Good Luck!! I like Tate's Bake Shop on Facebook. I like Southern Sweets on Facebook. 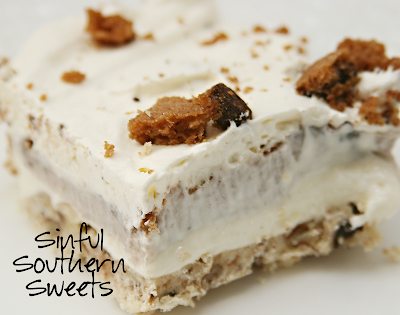 I follow Sinful Southern Sweets on Twitter. Love that layered cookie dessert. Sinfully delicious. I follow Tate's Bake Shop on Twitter. I am a follower of yours via GFC. I already "liked" SS on FB and have been following you!! I follow SSS on Twitter faithfully! I follow Tate's Bake shop on Facebook! I follow Southern Sweets on Facebook! I follow Southern Sweets on Twitter! I now follow Tate's Bake Shop on Twitter! I follow via GFC already!